Now widely regarded as a superfood, people have turned to the pomegranate throughout history for its medicinal properties. As we approach the winter it’s a great idea to kick start your working day with a glass full of goodness that will help keep your immune system up to the task. I always found that smoothies were the best way of getting all my vitamins and nutrients before rushing off to the office. With a smoothie you get all the benefits of freshly cut fruits. They are nutrient rich and filled with fibres. 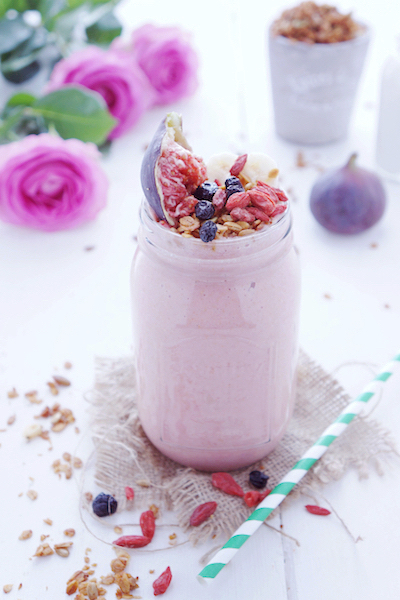 Further, you can blend a smoothie to suit your particular taste. For those really rushed mornings you can even take your smoothie with you on the train. Health Info – Get the glow with pomegranate! Pomegranate might soon become your Nº1 beauty product. With its high concentration of nutritious vitamins and minerals, it is known to be one of nature’s most powerful sources of antioxidants. 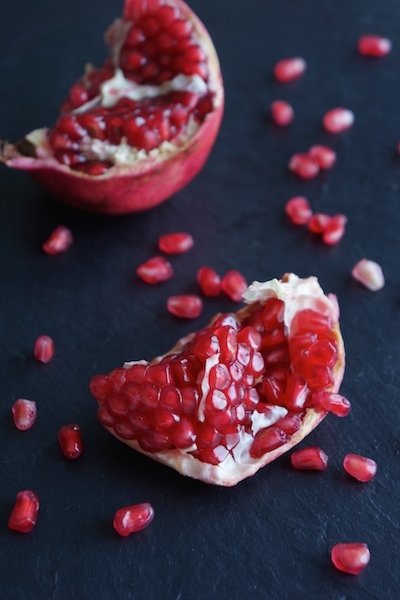 Find out how a regular intake of pomegranate could make your skin glow! Rejuvenate your skin! – The pomegranate fruit and oils from the seeds both support the epidermis and restore the dermis of your skin; they also promote cellular regeneration through the stimulation of keratinocytes. Control your pimples! – Pomegranates contain high levels of Vitamin C which regulates the sebum secretion of your skin – the main reason for pimples. In addition, pomegranate assists your digestion which can, in turn, have a positive impact in this regard. Maintain the health of your skin! – Pomegranate helps support skin elasticity and smoothness by assisting both in the preservation and creation of collagen. Protect your skin against UV damage from sunlight! – The fruit’s antioxidants help protect the skin from the impact of free-radicals – a potential result of UV damage. Add all the ingredients into your blender. Blend until smooth. Like it sweeter? Add honey or medjool dates to the blender. Are you in a hurry in the morning? Deseed the pomegranate the night before or just buy the seeds. For more antioxidant benefits, top with goji berries and dried blueberries. 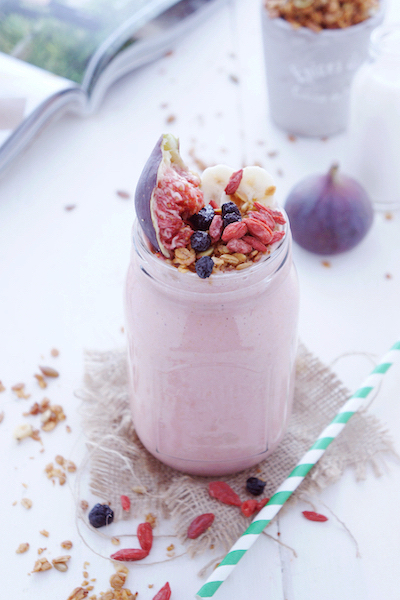 Top smoothie with granola, nuts and seeds for a more filling and nutritious breakfast. 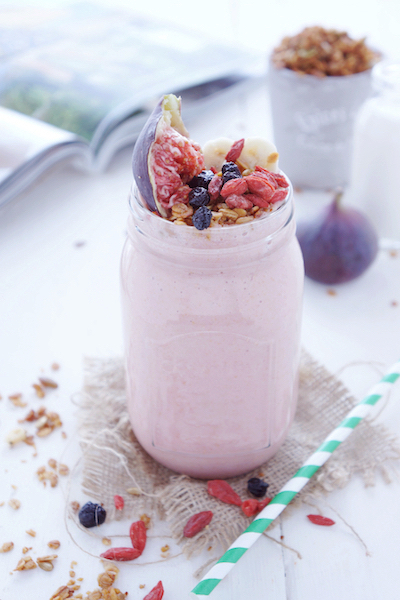 Freeze the banana or the pomegranate seeds overnight for a more chilled smoothie! The name ‘pomegranate’ comes from the medieval latin for ‘seeded apple’. In reality, the pomegranate is actually a berry. Not all its applications are healthy however, as it lent its name to the hand held explosive device commonly referred as a ‘grenade’ – both bomb and fruit look eerily similar and in fact, the pomegranate explodes when overripe in order to disperse its seeds. Jam jar glass; mini milk bottle; épices pot and straw. This entry was posted in Food, Food Photography, Food Styling, Health, Recipes and tagged drinks, photography, raw, smoothie, vegan, vegetarian by Françoise La Prune. Bookmark the permalink.